Twelfth Night or Twelve Nights, as it is called in some places, celebrates the arrival of the Three Kings to the birthplace of Christ. It is observed on January 5th, the night before Epihany, and marks the end of the Twelve Days of Christmas, although Eastern Orthodox churches celebrate the arrival of the Three Kings on a different day. The Three Kings, also known as the Wise Men or the Magi, were traditionally called Caspar, King of Tarsus, the land of myrrh; Melchior, King of Arabia, the land of gold; and Balthasar, King of Saba, where frankincense was said to flow from the trees. 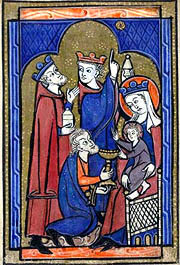 The Kings presented gifts of gold, frankincense and myrrh to the Christ Child. Gold symbolized kingship, frankincense depicted godliness, and myrrh represented a painful death. In return, charity and spiritual riches would be offered for the gold, faith for incense, and truth and meekness for the present of myrrh. The Wise Men returned home and, in 7 A.D., it is said, Saint Thomas the Apostle discovered the Kings in India and baptized them. They are said to have become martyrs and their bodies buried within the walls of Jerusalem. It is believed the remains were later moved to Turkey by the Emperor Constaine's mother and, later still, to Milan, Italy until they were finally laid to rest in Cologne (Köln) on the Rhine River in Germany. Twelfth Night was a part of the year-end festivities in the British Isles and France. These celebrations originated in the 5th century when French and English churches created the "Feast of Fools." "Temporary Bishops" and "Archbishops of Fools" play-acted, reveled and generally caused mischief. By the fifteenth century, such ceremonies were banned from church by the French government due to lewd behavior. 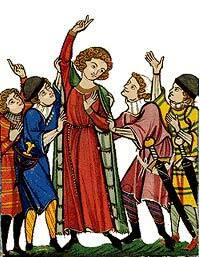 A new street festival was created and a temporary "king" for the season known as the Prince des Sots was elected. In England, this king was called the "Lord of Misrule" and, in Scotland, the "Abbot of Unreason." The king's reign began on Halloween and lasted for three months. The "state duties" of both the French and English kings ended on Twelfth Night. 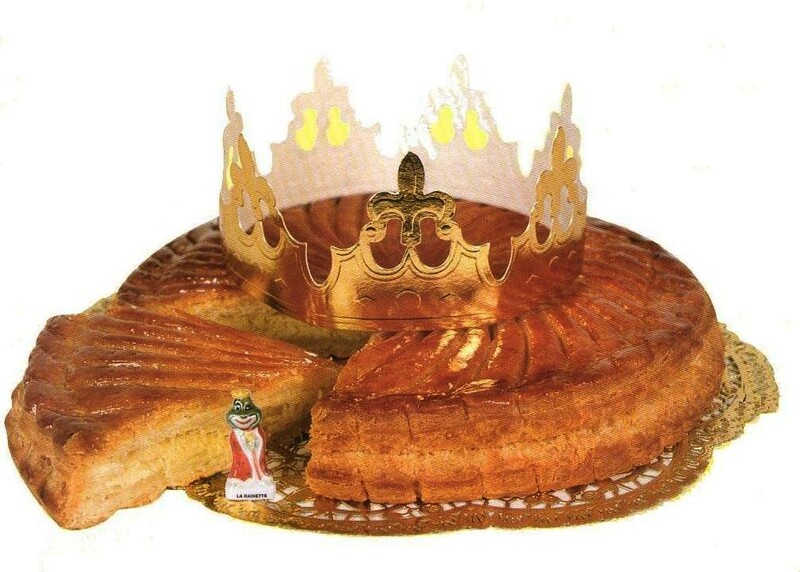 A cake called Galette du Roi or "King's Cake" was consumed and marked the end of the celebrations. In addition, a large cake with a hole in the center was placed on the horns of bulls for the Twelfth Night Games and wine and ale was imbibed by all. Originally, cake was a symbol of the pre-Christian Goddess. Bulls' horns represented the consort of this Goddess and her spirit was the ale and wine. This custom is the origin of communion. Celebration of such Twelve Nights festivities was no longer a tradition by the mid-19th century, but were replaced with "Mummer Plays," which are still performed today throughout the British Isles. The troupes of performers are known as Morris Dancers and consist of six men who dance complex steps to the accompaniment of an accordion or fiddle. One of the men is dressed as a woman and is called Maid Marian. Other characters include Robin Hood and Friar Tuck. Another man, dressed in a horse-skull mask and a wide-hooped petticoat, chases young women and covers them with his skirt. He is known as the "Hobby Horse." Supernatural events are thought to occur during the Twelve Days of Christmas. The "Wild Hunt" and "Faery Host" are thought to ride through the countryside collecting souls. In Ireland, these beings are referred to as the "Yule Host." 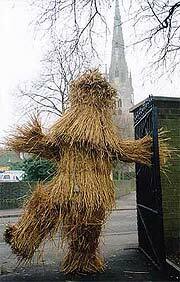 In Whittlesey, the Sunday before the first Monday after Twelfth Night is the "Procession of the Straw Bear." A man wrapped in straw from head to toe dances through the streets while other Mummer Plays feature such characters as the "She-Males." These are men who dress up as old hags for the celebrations and represent the Goddess of Winter. During early times in rural Austria, the Twelve Nights between December 25th and Epiphany (January 6th) used to be referred to as "Smoke Nights," due to the fact that incense was burned. Today, this is done on January 6th. The head of the household moves through the farm with incense in order to "smoke out" any evil spirits. Holy water is sprinkled on the house, the grounds and the barns. The head of the family then uses chalk to mark the door with the initials of the Three Wise Men—K(aspar), M(elichor) and B(althasar)—along with the number of the year. This lettering replaced the original pentagram chalkmark of ancient times which prevented evil spirits from entering the home. Austrian Twelve Nights celebrations also feature parades of costumed characters who blow horns and crack whips intended to drive away spirits. In Styria, a parade of bellringers known as Glocklerlauf takes place on January 5th. Elaborate headdresses are made for this occasion. On December 6th, children dress up as the Three Kings and the Star of Bethlehem in order to go caroling. They are rewarded with hot chocolate and gingerbread. In certain areas of the Alps, the traditional Twelve Nights custom is to light bonfires. In the Netherlands, midwinter horn blowing known as midwinterhoornblazen is an ancient Yuletide tradition that dates from 2500 B.C. The sound is designed to drive away evil spirits and sometimes the horns can be heard up to three miles away. The instruments are specially carved from birch and elder trees, with a competition held on January 6th to decide the most proficient musician. "Saint Thomas Ringing", called St. Thomasluiden by the Dutch, is continuous bell-ringing in the bellhouses of Friesland cemeteries. The bells toll for the death of Saint Thomas a Becket, the English Archbishop of Canterbury who was murdered in his Cathedral on December 29, 1170. January 6th is known as"Three Kings' Day" or Driekoningendag. An Epiphany cake is baked and whoever finds the bean inside is king for the day, complete with gold paper crown. After this ceremony, the holiday season comes to an end and families remove their decorations. Many Dutch towns have organized burning of Christmas trees. In France, the Twelve Nights feature the displaying of a creche or crib. This was invented by Saint Francis of Assisi in Italy on Christmas Eve, 1223 A.D. He turned a nearby cave into a stable, erected a manger and held a service. The French creche or manger scene is put up in the home and gifts are exchanged on January 6th. Young people dressed as shepherds and shepherdesses go to midnight mass at church carrying drums and pipes and torches to find their way. The French carol, "Bring a Torch Jeanette-Isabella" is a lyrical illustration of this custom. This marzipan-filled puff pastry is a favorite Twelve Nights treat in Paris, northern France and Belgium. It is usually decorated with a golden paper crown like this. You can prepare this cake ahead of time, refrigerate, then bake it just before serving. 1 or more dried beans, metal charms, or tiny porcelain figurine. Thaw puff pastry in the refrigerator overnight. Take the puff pastry out of the fridge and let it warm up to room temperature before using it. Pre-heat the oven to 450° F. Roll each sheet of the pastry to 10" (if necessary) and cut off the corners to form a 10" circle. Butter a medium size pizza pan or a cookie sheet and lay one circle of puff pastry on it. Cream the butter and one egg in a bowl. Add the marzipan and mix them thoroughly. Roll or pat marzipan paste into a circle. Lay the paste on the pastry base, leaving two finger widths all round. Bury one or more beans or charms in the paste. This cake comes from the British Isles and uses fresh oranges, imported from the Mediterranean this time of year. Decorate the cake with candy to make it look like a jeweled crown for the Three Kings or, in homage to goddess traditions, bake the cake with a hole in the middle and decorate with fruit slices. Either way, you can hide a bean and a dried pea in the cake batter before baking. When it is eaten, the person who finds the bean is the King of Fools and the one who finds the pea is the Queen, regardless of the gender of the finder! Gum drops, candied fruit, etc. If you want to add this article to your list of favorites or email it to a friend, please use this permanent URL, https://stores.renstore.com/-strse-template/0601A/Page.bok. Permission is granted by the author to quote from this page or use it in handouts as long as you include a link back to Renstore.com.